"Even for those who have left no special monument, for those unknown, there is still glory, still honor." While no formal records remain for this burial ground, local researchers have pieced together partial records of interment from newspaper obituaries, funeral home records and death certificates. Those buried in the cemetery were the poor and the elderly, the mentally ill, the orphans and the disabled without anyone able to care for them . To consider this burial ground, we must also consider the institution to which it was connected. Looking at the history of a poor farm, also called a 'poorhouse', is to look at the development of social programs in the United States and local communities. Poorhouses emerged in early 19th century as one of the earliest widespread applications of public funds used for 'relief' of poverty in the United States. Prior to this, churches and private charities were responsible for providing assistance . Poorhouses were in the control of local government, often at the county level. Poorhouses took in those unable to care for themselves due to financial situation, state of health or young or old age. The system of non-differentiation between temporarily unemployed, the mentally or physically disabled, and young children and the elderly proved to be ultimate demise of the poorhouse system. Poorhouses were unsustainable and quickly earned the reputation of being dirty and inhumane . However, the poorhouse system continued until the reform of the Progressive Era during which the needs of people began to be differentiated, giving rise to more specialized institutions able to offer better and more sustainable assistance . Orphanages, mental hospitals, nursing homes and veteran hospitals are direct impacts of the poorhouse system. Other social programs that did not involve in-institutional care, but rather provided systematic and monthly assistance for people able to care for themselves but in need of food or shelter also emerged. Land for the first Champaign County Poor Farm was first purchased in 1857 in the township of St. Joseph. The original poorhouse in Champaign County was 116 acres. Initially, men were awarded contracts for the “keeping of the paupers of the County and the renting of the County Farm” . Whoever won the contract to provide for the 'paupers', would then have the right to put the 'paupers' to work on the land. In 1863, it was decided that each township within Champaign County would care for its poor instead of operating at a county level and the county poor farm was temporarily dissolved for two years. In 1865, officials reverted to the county system and a new tract of land consisting of 42 acres a mile east of the Champaign County Courthouse was purchased for a county farm. By 1866, a house had been built at a cost of just over $7500. The system of management shifted in 1887 from contract base to elected official. A superintendent was elected to manage the poor farm and house. The living quarters for the non-insane separated the men from the women. Men and women had separate dining rooms, sitting rooms and sleeping quarters. For the sake of economy, a boiler system was used to cook the food, consisting primarily of steamed vegetables. Acreage was added to the complex over the years to expand the farm portion. The grounds of the Champaign County Poor Farm included: a large house, a cell house for the insane, shelters for livestock and fields for crops. Inhabitants of the poor farm were expected to work. Ideally, the poor farm would be self-sustaining through the crops and livestock; however, the inhabitants of the Champaign County Poor Farm consisted almost entirely of the elderly, the disabled and the chronically ill who were physically incapable of work, hence their residence at the poor farm. This proved to be a fundamental flaw of the poor farm system. 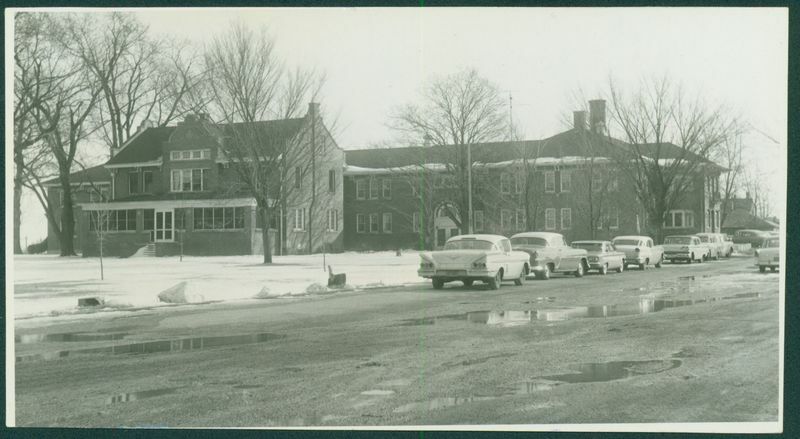 The Champaign County Poor Farm transitioned to the Champaign County Nursing Home in the 1930s . The burial ground was south of the house. Interments were made until the transition of the building to the County Nursing Home. Not all residents of the poor farm were buried on the grounds, but many were. Following a death, the superintendent would attempt to contact a relative, but often there were no living relatives or the relative would refuse the remains, leaving the Champaign County Poor Farm to attend to burial. Based on obituaries in local newspapers, funeral services accompanied many of the burials at the poor farm, especially for those who had been long-term residents there . The fate of the Champaign County Poor Farm burial ground was a common one. As poor houses and farms closed and were converted to other uses, the burial grounds connected to them were often forgotten . As these burial grounds are rediscovered across the United States, efforts similar to Champaign County's have been made to remember the forgotten. 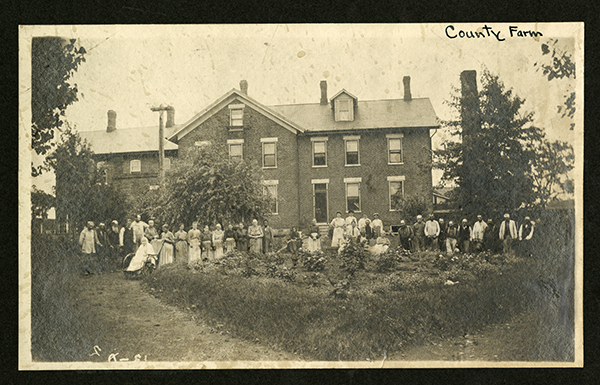 Residents of the Champaign County Poor Farm: Image courtesy of the Champaign County Historical Archives, Urbana Free Library, Urbana, IL. The Champaign County Poor Farm: Image courtesy of the University of Illinois Archives, Found in RS: 39/2/24, Box 1, Folder 303-389, Image Number: 337. Contributed by D.H. Lloyde. Laura Miller, “Champaign County Poor Farm Burial Ground,” ExploreCU, accessed April 18, 2019, https://explorecu.org/items/show/255. Baselt, Fonda D and Josephine Moeller. (1984). Cemeteries of Champaign County, Illinois: A Location Guide with Plat Maps. Champaign, IL: F.D. Baselt & J.F. Moeller. Whiteside, Thomas (2000). “Partial Listing of Interment at the Champaign County Poor Farm Cemetery.” Champaign County Historical Archives, Urbana Free Library. Hansan, John E. (n.d.) “Poor Relief.” The Social Welfare History Project. http://www.socialwelfarehistory.com/programs/poor-relief/ Crannell, Linda. (n.d.) “History of 19th Century American Poorhouses.” Poorhouse Story. http://www.poorhousestory.com/history.htm Katz, Micahael B. (2006) “The Poorhouse: America's Forgotten Insitution, by David Wagner.” Social Forces. 85.2, p. 1056-1057. Unknown. (n.d.) “Early History of the Champaign County Poor Farm.” Champaign County Historical Archives, Urbana Free Library, Urbana, IL. 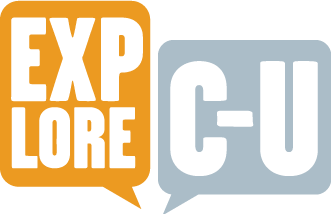 Digitzed by American History Teachers' Collaborative. http://www.usd116.org/ProfDev/AHTC/images/Champaign-County-Poor-Farm/poor-farm.html . The County Poorhouse. (1890, Nov. 24) Champaign Daily Gazette. 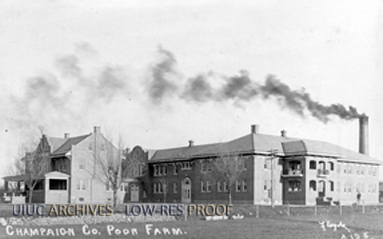 Champaign County Poor Farm Digital Collection. American History Teachers' Collaborative. http://www.usd116.org/ProfDev/AHTC/images/Champaign-County-Poor-Farm/poor-farm.html . Rowe, Claudia. (2002). “Forsaken in Life, Forgotten in Death.” The New York Times. Feb. 4, B3.